Moscow - Liverpool manager Jurgen Klopp cut a tetchy figure during a slightly shambolic press conference in Moscow on Monday to preview his side's Champions League game against Spartak Moscow. Sound issues, some peculiar questions from local reporters and a confused interpreter made for a surreal atmosphere, but Klopp was also irritated by the questions he received from the British journalists present. In response to a fairly lighthearted question about which Liverpool players he loves, after his Tottenham Hotspur counterpart Mauricio Pochettino declared his "love" for Harry Kane, the usually genial German pulled a face. "I'm really impressed that we are in a Champions League press conference and we talk about things like this. I really don't understand the business anymore," Klopp said. "Yes, I love the club, that includes the players. I love Harry too. But he's a Tottenham player. I love good footballers. That's how it is." As the female interpreter, sitting to his left, began to translate his answer into Russian, Klopp interrupted. "It's not important for Russia, the question or my answer," he said. "It's just an English thing. Pochettino loves Kane. And who do I love? That was the question. It's a waste of time." 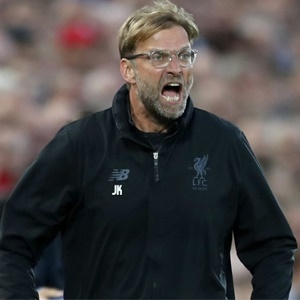 Klopp was similarly unimpressed by a query about his team's well-documented defensive problems, which have seen them concede 10 goals in their three Premier League away games to date. Asked what the solution was, Klopp told his audience in a hotel suite at Moscow's Sheremetyevo Airport: "Work better together. "Defence how I understand it is a teamwork thing. That's what we were speaking about. I know you and your colleagues (in the media) talk about different things, but I talk about the team performance. "We have to defend better and that's what we're working on all the time." Loris Karius, who Klopp has confirmed will start in goal instead of Simon Mignolet at Otkrytiye Arena on Tuesday, said he and his team-mates have been working on how to tighten up at the back. "We scored a lot of goals up front and sometimes we conceded a few," said the German goalkeeper, who kept goal in Liverpool's 2-2 draw with Sevilla in their opening group fixture. "I don't think that's just down to the defence. It's got to do with our very offensive style of play, which means we sometimes take a few risks in defence. "It's worked very well for us in most of the games. Some goals, we had a few words about as a team. I know we can defend them better. "But we learned from it and we practise in training. Of course we look at things and we know where we can do better in defence. There's not really any worries because I know we have the quality." Russian champions Spartak looked set to open their Group E campaign with a useful 1-0 victory away to Maribor, only for Damjan Bohar to net an 85th-minute equaliser for the Slovenians. Spartak's Italian coach Massimo Carrera worked alongside Antonio Conte at Juventus and he has sounded out the Chelsea manager about how to get the better of Liverpool. "We've discussed Liverpool with Conte," said Carrera, who led Spartak to their first Russian title since 2001 last season after succeeding Dmitri Alenichev at the dawn of the campaign. "It's obvious that they're strong and have plenty of star players in their line-up. Our defence will likely have some tough times on Tuesday. "But our main goal is to give Liverpool's players no time or space." Spartak have injury doubts over Dutch midfielder Quincy Promes and Brazilian striker Pedro Rocha.